Picture the coolest and most hilarious thing you can imagine and bump it up by two or three factors of amazingness and you might -- just might -- come up with something nearly as spectacular as this, a little car that runs on abandoned railroad tracks. Like all spectacular ideas it's brilliantly simple: a little motor from an old gravel crusher, wheels made from aluminum car rims, a welded steel frame, and miles of abandoned railroad tracks. A go-cart for adults? It glides along the rails so smoothly that it has more than enough power to carry 6 people and a bunch of stuff through the backwaters of Sonoma County. We hit 20 mph when we were testing it, but mostly we cruised around 12 mph or so. It has bike pedals on the front but they're not connected anymore. No big deal, if the engine died it'd probably be easier to walk and push it anyway. It's so smooth you could push it with one hand and hardly notice the load. None of this is to say it's quiet... Here's a video of us puttering down the tracks, click clack and all. As Anton pointed out these must have been "Grade C" rails since they're super short, like 12 feet each, which means lots of junctions causing lots of clacks under the wheels. And I'm only pedalling to confuse you, it's not actually doing anything. Looking ahead to nothing but open rail. Rusty, sometimes over-grown, usually straight, open rail. It's a testament to modern pesticides that this rail was as clear as it was. I'm pretty sure 100 years from now there still won't be anything more substantial than fennel growing here. Go science! Whoops, a Big Wheel stuck in a storm drain, perfect for Bring Your Own Big Wheel, a sort of race where Big Wheels drive down the curvy part of Lombard Street, which happened to be later that day. Actually the vehicle criteria is "anything with plastic wheels", so this non Big Wheel truck would do nicely. Too bad it only had 3 of it's 4 wheels left. We never made it to the race, but it made a hell of a passenger seat on the train. Lots of diving along the tracks, and lots of breaks for food and Big Wheel type adventures. In a hurry we were not. There's something about a silly little car that makes everyone happy, and a silly little car that drives on rails doubly so. Note the rust on the rails. 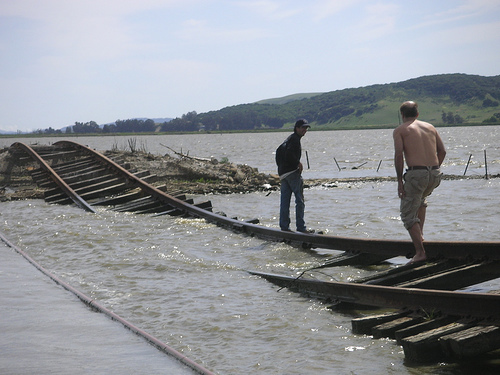 We're not sure how long these tracks have been abandoned, but Anton thinks it might be decades. Inside... What's this? Anton's long lost twin? The caption reads "you know you likes Jeremey's mom". Who wouldn't likes Jeremey's mom? More shots of the house, everything tremendously over built in cast concrete and steel. It was super industrial, whatever it was. More signs of Jeremey's mom. Here's an interesting one: that calf is probably just hours old, the mother still had the placenta hanging from her. And I love the fact that one of the first things this calf saw on this planet was our little train car. Some of the road crossings took a little effort. A 40 ton train might make new grooves in any road, but a 40 ton train hasn't been down these tracks in years, so all the new roads weren't very traincar friendly. No big deal, we'd just get out and push. Crossing the busy roads full of drunken tourists on their winery tours was another matter.... Here we are, a bunch of clowns pushing a little clown car across a busy highway. I wish I could have gotten pictures of the looks on the drivers' faces. This was on the edge of a farm, I hope the next time I'm here these will be in use as chicken coops. Playing around on the roof of the old trains. My favorite is going over the old bridges. Especially this one, with lots and lots of water rushing underneath. Hmm, how sturdy is that old wood? Bill running ahead to clear off the many branches in this windy stretch. Whoops, end of the line. Actually we might have been able to make it through, but we'd have probably drowned the engine. So TrainCar v2.0 will of course have an engine mounted a bit higher, or a snorkle on the air intake, or both. But look how beautiful this spot is. I mean this is just silly. And of course standing around taking pictures of each other at End of the Line. I flagrantly stole the above pic from Bill's Flickr set of the day, by the way.